SECTION I - Trained or Sculptured Gesneriads - An educational 3"◊5" white card stating what training the exhibit received and how it is to be viewed (all sides or from the front) is suggested. Entry No. 440, Columnea 'Gold Heart', exhibited by Charlene Marietti. Score: 92. First Place. Entry No. 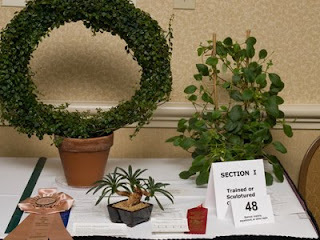 289, Chirita linearifolia, exhibited by Carolyn Conlin-Lane. Score: 83. Third Place. Entry No. 411, Alsobia 'Iris August', exhibited by Nancy Carr. Score: not scored.